‘Extreme weather’ doomsayers must be scratching their heads over this. Nothing to see here – move along. 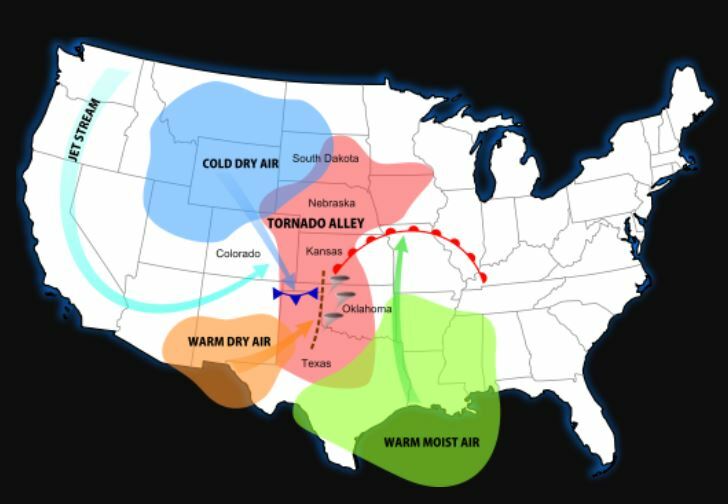 In a twist that would ruin the storyline to the Wizard of Oz, the USA’s ‘Tornado Alley’ has been strangely quiet this year, says BBC Weather. In fact, if there are none reported in Oklahoma or Kansas on Thursday, 2018 will officially be the quietest start to the tornado season in both states …on record! The “Alley” covers an area surrounding north Texas, Oklahoma, Kansas, Nebraska, Louisiana, Arkansas, Missouri and Iowa (as well as the fringes of bordering states). It is in this zone that the USA records some of its most frequent and devastating tornadoes. Late spring sees the peak of the tornado season in these areas due to the clashing of air masses. The normal weather set-up at this time of year sees the jet stream dipping southwards just to the west of Tornado Alley. This encourages warm, moisture-laden air to be drawn up from the Gulf of Mexico. Overlaying this is usually a layer of drier air originating from southwest USA and northern Mexico. This behaves like a lid, trapping all that warmth and moisture in the lower atmosphere. However, as the jet stream continues to bring in colder air above that lid, it eventually breaks down, allowing all that pent up energy and moisture to burst skywards into massive tornado-spawning thunderstorms. Where are they this year? 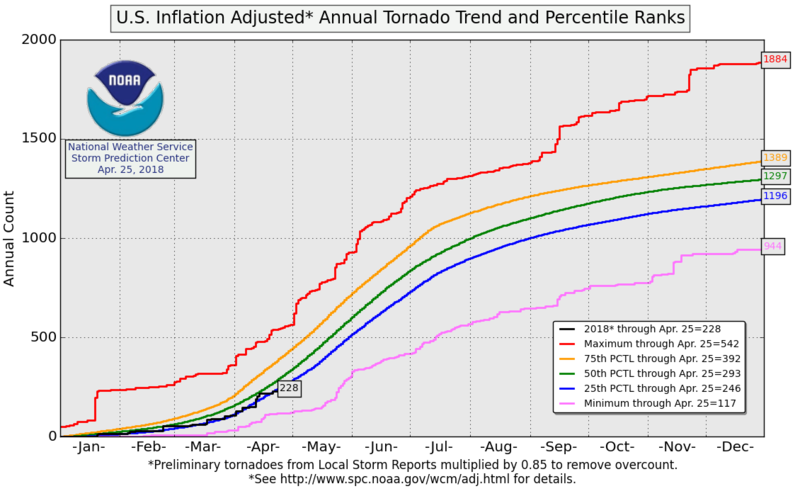 This year has been possibly the quietest tornado season in recorded history. Kansas and Oklahoma would expect to see close to 19 tornadoes between the start of the year and now, with around 13 or 14 in April alone. But this April, there hasn’t been one! Even in the tornado-barren Aprils of 1987 and 1988, Oklahoma had already seen them earlier in the year. The clue as to why it has been so quiet lies in the overriding weather patterns across the USA so far this spring. The jet stream, instead of digging down to the west of Tornado Alley, has pushed further south and east than you would normally expect. This means the usual flow of warm and moist air from the Gulf of Mexico has deflected further east, and Tornado Alley has been stuck in abnormally colder, drier air. Yes, there is a lack of tornado activity in Oklahoma and April may turn out to be the coolest April in Oklahoma history, which probably has a lot to do with the lack of severe thunderstorms and tornadoes. The CAGW narrative says we should be experiencing larger numbers of tornadoes, and more powerful tornadoes, but it appears the narrative got it wrong. I hope all our Aprils are this nice. A little cool, but nice. “Where are they this year? Mother Nature, flipping the bird at garbage-in-garbage-out climate models and the extreme weather parrots! This is absolute proof that it is worse than we thought! Total disruption of the climate!! 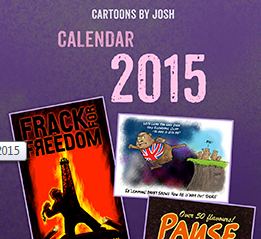 It may be quiet now but all it takes is one outbreak for the ambulance chasing climate vultures to come out in force. Will global warming cause more tornadoes? If so, that has not happened yet. Brooks et al. looked at the incidence of tornadoes in the US since 1954. They found no significant trend (-0.01/decade) in the number of tornadoes, although there was increased clustering. I thought that was old and settled science. It was never explained as to why, but tornadic storms follow a pattern. And they need specific inputs to form. And those inputs follow a cycle. And, that cycle is out of sync for this year. We can sit back and enjoy the clouds. And prepare for tanning time.